The other night I watched The Social Network on Blu-ray, and soon I’ll be writing a review of it. 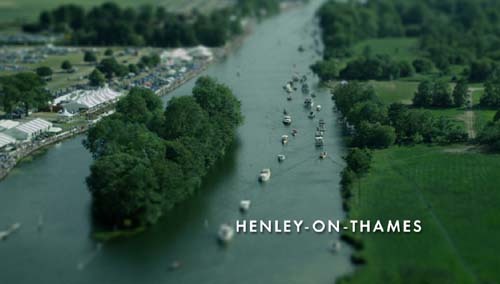 But I wanted to highlight here one brief part of it: a section starting around 84 minutes into the movie, called ‘The Henley Royal Regatta’. This has a couple of the characters competing in this famous UK rowing race, and the most startling imaginable photography is employed. I had to crop before resizing downwards. Shrinking the whole frame to size diminished the effect too much. Now when this scene appeared on the big screen, I literally said ‘Wow.’ And then I peered more closely. The scene looked so much like a miniature that I had trouble convincing myself that it really was a live shot scene employing the tilt lens effect. But the next couple of dozen shots in this sequence employ the same technique, so it soon become apparent that this really was a manipulated live shot. Loot at it: the whole thing looks like a miniature tableau in a museum. This one really is a minature. I photographed this at the Edo museum in Tokyo back in 2003. 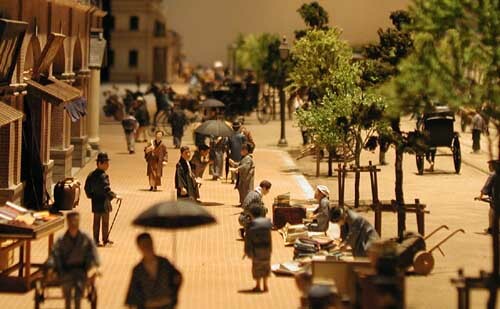 Those people are beautifully crafted, and each stand only about a centimetre tall! The photograph is a closeup. Consequently the depth of field is very shallow, with the foreground and the background very much out of focus. Normally a live photography shot of a distant scene would have everything in sharp focus. The tilt lens effect throws the foreground and background out of focus and this makes the scene look close and small. Wikipedia even has a specific article on this effect. But why does it make these scenes look small and close? Why does focus matter so much? Well, as I keep saying, depth perception is an illusion. Our visual mechanisms (eyes and video processors in the brain) use certain cues to present us with a good-enough representation of the world around us. ‘Good-enough’ means one that allows us to avoid dangers, find food, protect our mates and children, and that kind of thing … human universals going back at least 100,000 years. For 99.99% of that time we did not have computers or tilt lens photography. So, to our eyes and brains: shallow depth of field means that something is close to us. Our brains go a step further and make humans look like little dolls, because it assesses distance in part on the size of known objects. In this case, I’d say, the shallowness of the depth of field trumps the size cues, so the brain doesn’t hook them into the ‘human recognition’ centres of the brain. This entry was posted in Blu-ray, Imperfect perception, Video. Bookmark the permalink. My Samsung camera has a setting to create this effect in a real scene. I expect judicious use of a Lensbaby could also create it. I wonder if reason this lens effect makes things look so real is because it mimics the way we see. Ie when we look at something(close by) we tend to focus on something with everything before it and beyond it out of focus ?